Are you a teacher, administrator, or custodian who believes recycling is important? A Baker High School student signs her school's recycling pledge. Wondering how to get everyone involved? OCRRA offers many FREE tools to get your school on the recycling bandwagon. Our newest tool is the School Recycling Pledge! 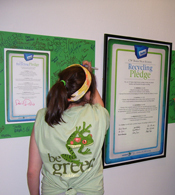 This 2 x 3 foot framed pledge highlights your school’s commitment to recycling. Have key people such as the principal, administrators, custodians, teachers, and students sign it and then display it prominently. This will show the world your promise to maintain an excellent recycling program. OCRRA has a pledge available for every school in Onondaga County; all you have to do is call and ask for yours. Email us today or call 453-2866 to learn more about getting a free pledge for your school! How effective is the pledge at increasing recycling? Check out our School Pledge Survey results to find out.